Giving your heart to someone sounds painful. Let the "professionals" at Hangman's help! 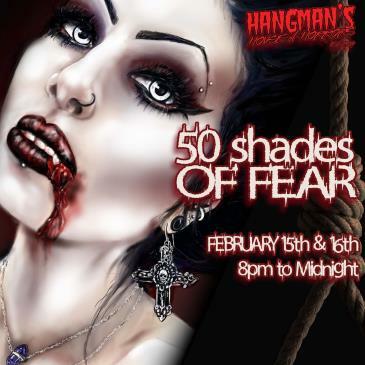 Join us for an unforgettable Valentine's experience as we present our annual Valentine's haunted house, 50 Shades of Fear, combined with a live Action Vampire Hunt. Use infrared tactical training weapons to hunt REAL vampires at 50 Shades of Fear presented by Hangman's House of Horrors. In addition, you'll still get access to our classic main attraction Hangman's House of Horrors.